I've been really busy, especially in the last week or so. Kathy and I got away from town for the holiday weekend, then I got back. Yesterday I got a request from one of the folks on the VT Roster to offer a decent source for a reliable local weather forecast. I told him that we don't really have such a thing, since the county is so varied in terms of elevation--we have lots of microclimates just within Chaffee County. The outlook is generally good. Doesn't look like a major cold front is headed our way. Normal pattern for this time of year, not too volatile, and not looking to be more so on Sunday. Edit: Looks like my web weather info talents are lacking--a cold front DOES appear to be headed our way. Ah well, on with the post. 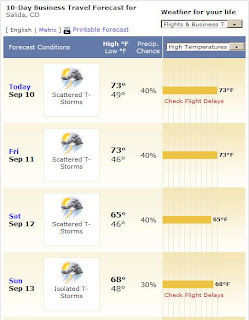 But in looking at the forecast from good ol' whitebread weather.com, I saw an illustration that gave me pause. It's just three days away! Am I ready? What will that 24 hours of pain be like for me? Finish or not? Stay in control of my head or lose perspective, rationality, emotional control? I've been training, I've been getting my head together. I think that the taper I started 10 days ago will serve me. I have practiced eating a wider variety of food when I'm out in it. I am committed to getting all the planning tasks and setup done where my race director duties are concerned so that on Saturday I'll be able to rest, and get my head together rather than being wrapped up in the stress of last-minute problem solving. But there's the nagging concern that settled into my thinking after my near-finish in 2007; that I may simply be incapable of finishing the big loop between 10 PM and the cut-off. That I won't be able to maintain a finisher's pace, even if I do everything right. Gonna try. All you can do is try. Of course as Yoda said, "There is no try, there is only do or not do." But honestly, what the hell does that sawed off little plush toy know about the Vapor Trail? heck man, if I pulled it off last year, you can too.